Sometimes less is more. And I’m not just talking bout size, as there were enough good things said about Tiny Epic series. The unassuming Sushi Go! from Gamewright spots a minimalistic game design with cute theme and adorable art. Packaged in a neat tin box, it delivers tons of fun in fast-paced, easy to pick up game with a winning charm and universal appeal. Three to five players are competing in assembling the most impressive collection of adorably rendered sushi on their plates. The game consists of three rounds – each round the player starts with a certain amount of cards in their hands. On their turn, each player puts down one of the cards from their hands and passes the rest of the cards to the player on their left (a mechanic most will be familiar from 7 Wonders). The cards score points – there are eight types and each has its’ own unique scoring mechanic. Sashimi for example will score you ten points but only if you play three of these during a round. Dumplings on another hand give you points that grow the more of these you play in a round. Not all cards are scored at the same time – for example all pudding played is left for dessert (of course!) and points it provides are calculated at the end of the game. Finally, chopsticks don’t provide any points on their own, but rather allow you to play two cards on a future turn instead of just one. After a round is done (all cards were played), the scores of all players are counted up and recorded (unfortunately no scoring pad is provided with the game). After the third round the results are tallied, the dessert result is applied and whoever finishes with the most points is the winner. The game rules are extremely simple and you can explain these without difficulty even to novice players. The different scoring mechanisms are conveniently illustrated on each card, serving as a useful reference. The games themselves go very quick, especially after the first round. You are basically trying to maximize the amount of points you are going to score by picking which combinations of sushi you are going to go for – are you going to try to go for the high-scoring sashimi cards and take the risk that someone else is going to prevent you from collecting a set of three? Or play it safe with the trusty low-scoring unfortunately named nigiri for guaranteed points? There is certainly very few opportunities for analysis paralysis and this simplicity serves the game very well, keeping the game moving gingerly. The competition aspect of the game is very indirect, mostly limited to maximizing your own score, while occasionally playing cards to prevent opponents from getting something they really want. The game works equally well with three to five players, without much of a difference in game dynamic. There is a two-player option introducing a dummy player that provides an adequate substitute, but is not as fun as playing it with the intended group sizes. While the official number of players caps at five, it is conceivable to play with six, adjusting the number of cards dealt each round. It will be less balanced but in all honesty precise balance is not the reason you should be playing Sushi Go! The game certainly does not overstay its’ welcome, wrapping up in a tight 15 minutes, placing it squarely in the light filler category. In a word – great. The art on the cards is absolutely impossible to resist and immediately sets a positive tone for the game. You try feeling negative when there are little adorable tempura smiling at you from the card! The light mood of the game combined with the excellent art direction really hit the spot in making sure that Sushi Go! is a highly enjoyable experience – you might not be giving your brain the workout it gets during Terra Mystica, but you are definitely having fun. The gameplay itself is also brisk. The fact that each round will contain a different set of cards due to completely random shuffling creates many unexpected scenarios to adopt to. Now sometimes it ends up feeling not fair, for example if you really need that third sashimi but there is simply no more in this round. Or you get a hand full of maki rolls that you can’t do much with. But the round is over so quickly that you are never left to dwell on these. There is a good balance of figuring out how to score most points for yourself and watching for what others are trying to do in order to foil their plans. Expert players might try keeping track of the cards in all the hands as you see them through a few turns to devise the most efficient strategies. It is definitely a very light game though, dependent on the luck of the draw, so those craving s heavy euro will be getting a raw deal. Sushi Go! sets a very modest goals for itself and absolutely aces these. It is a very affordable (under $15), kid-friendly game that feels fun and goes quickly. For a game about scoring points it manages to not devolve into a math exercise and it also introduces players to the card drafting mechanic used in more complex games (hello again, 7 Wonders). I would absolutely recommend you add this game to your collection – this likable filler will work well both as a break for experienced players and a starting point for new ones. I have to warn you though – by the end of three rounds you will be craving a delicious sushi roll! If you enjoyed this review please visit Altema Games website for more reviews with photos and other cool board game stuff! So you’re sitting down casually in a sushi bar with 4 other friends, looking to get a good fill late at night, when the chef announces the store’s about to close and he only has enough ingredients for 3 more rounds of dishes. You eye each other and raise your chopsticks as the chef unloads the first set of meals onto the bar’s conveyor belt.. In Sushi Go players draft meal cards over 3 rounds, trying to end with the most points at the end of the game. For those unfamiliar with the drafting mechanic, it means each player starts with a hand of cards, then plays one and passes the rest to the next player. They then receive a new hand of cards from the player previous to them, and choose another card to play then pass the rest again. This continues until all cards have been played and that marks the end of a round. -Egg Nigiri (1), Salmon Nigiri (2), Squid Nigiri (3) : worth a flat 1, 2, or 3 points each. There is also the Chopsticks, which gives no points at the end of the round (it is inedible). But while still drafting on any turn when you have Chopsticks in front of you, in addition to the one card you play from the current hand you can choose one other card in that hand and switch that with the Chopsticks you have, essentially pulling two cards from a particular hand that turn. Great move if all the lucrative cards are stuck in a single hand for that round. The Chopsticks card gets passed on to the next player with the rest of that hand, of course. And finally there is the Pudding, which as a dessert does not immediately give points at the end of each round. Instead, unlike other meal cards and the Chopsticks, Pudding cards are kept across rounds and at the end of the three rounds (dessert time!) the player who hoarded the most Pudding cards gets 6 points, and the player with the least gets -6 points. Most total points after three rounds walks away from the bar most satisfied and wins the game. Lightweight, fast, and very easy to teach and learn, yet is a drafting game that is still filled with meaningful decisions. Some measure of card counting can be useful to predict what other cards exist in a round, especially in a 4-5 player game where it takes more time before players get to see all the hands, and observation of what combos other players are going for is key as each round the cards are limited (may not have enough sashimi cards for two players trying to complete their set, for example). And yet the game is straightforward and simple enough that turns whiz by, so all of that consideration and decision-making never stops – here comes the next hand. One round is enough for several sets or combos too, and so you’re often left in a good feeling of tension over which combo to pursue next. Perhaps you have several on the run – the Wasabi is still alone in your table, and so while waiting for the lucky hand that brings the Nigiri you need you’re building your Sashimi stack quietly. The next round, you saw a lot of Dumplings in your opening hand, and two or three more in the next hand – deciding that there is enough Dumplings to end with 5 at this round if you start early, you place a Dumpling card this turn – in doing so announcing to the rest of the table that they will have to compete with you if they go for a Dumpling strategy. Maybe they won’t take that hint and join in on the Dumpling bandwagon then, so you abandon early and go for Tempura and Maki Rolls instead. You’re never left with an obvious choice, and each round and hand keeps you on your toes with interesting and deliciously agonizing decisions. Telltale signs of a good drafting game, really. The cards are good quality and the illustrations are simple and exquisitely delectable. Cards are also color-coded in subtle yet distinguishable pastel tones, with concise and clear help-text in the bottom. But most of all is the heartwarming, cute sushi characters alive, bouncing, and smiling. Playing a game of Sushi Go full of 3 rounds of hands with the adorable critters coming and going, bellowing cries of “You took my dumplings!” aside it’s hard not to feel fuzzy and warm on the inside when all is said and done. Though note that it does come in a tin – some people don’t like that. When sleeving the cards the insert needs removal and the space left, though fits the sleeved cards, is an awkward size that leaves the sleeved cards rattling in said tin. You’d need to plug the gaps with foam or your favorite lining material. Thus if you sleeve your cards or you hate carrying tins you’d need an alternative portable solution or fix the tin yourself. Other than that it’s hard to come up with arguments against Sushi Go. Perhaps the only thing is that the game *is* light and thus gamers who have a taste for heavier/meatier fillers may find it wanting. Finally, at the low price point it asks for, Sushi Go is a title of great great value. Definitely a favorite filler in my group, and for me personally is a choice “gateway” title to carry around to introduce my family and other friends into modern boardgaming. Besides, who doesn’t like sushi? How about rows of cute, smiling sushi? This is the game that got my girlfriend hooked into games, period. We both are sushi lovers, so the theme alone got her attention. The fact that you trade hands, rotating the sushi around like a robo-sushi joint – sealed the deal. We play this now at least 3 – 4 times every 72 hours. It’s a great introduction for Card Drafting. In particular, my lady likes the fact that the set you create are done in different configurations with different payoffs, giving it a feel of a group of mini-games. At first, we were all about grabbing the Pudding Cards at all costs (aka Pudding Arms Race), given that in a 2 player game, the person with the most puddings at the end essentially has 12+ points – quite a dramatic bonus. But eventually, we starting doing the math as we went along and you start to see when it’s a good time to simply let the Pudding Campaign go, as it may or may not benefit you at a certain point, and your efforts are best spent elsewhere. It was a good 2 – 3 months before we felt like we grew into the different strategies that the game offers. We did play it with 4 people once, which is practically a completely different game. The planning of making your sets – assuming what is possible in your next hand-return, watching what your opponent is creating and reacting properly – is quite difficult. We’ve only played a 4-player game three times, so we might need to play it more to grow into the possible strategies for that configuration. But as a 2-player game – it is a weekly standard for us. My lady bring a copy in her purse when we go out. The artwork is adorable as well – it tends to attract attention from onlookers. Great gameplay, great graphic design – great game! On a trip abroad, I happened upon a sushi place called YO! Sushi. You sat at a counter while a conveyor belt brought plate upon plate of delicious sushi dishes past you. If you saw one you liked, you took it. When you’d had enough, the waiter tallied up your bill. The different colored plates were worth different amounts. Sushi Go! pretty much operates on the same principle. Different sets of cards are worth different point amounts. Sounds simple enough, right? Inside the brightly-colored tin, you’ll find 108 beautifully illustrated cards on solid cardstock. Smiling sashimi, grinning maki rolls, green globs of wasabi, happy puddings, and squid, salmon, egg nigiri. You even have chopsticks cards. Each player starts with a hand of cards (the number of which depends on the number of people playing). Play begins by deciding which card you want to draft, and you pass the rest to your left. Now you have nine cards to pick from, and you pass the rest. This continues until all cards have been drafted, and you score points based on the sushi meals you’ve prepared. At the end of round three, the player who has the most points wins. The fun comes in the choices you must make: Do you keep the wasabi (worth no points on its own, but it triples the point value of a nigiri card if you get one) or do you hold on to a pudding (a card that doesn’t score at the end of the round, but does at the end of the game)? Do you add another maki roll to your set, or do you try for your third sashimi—knowing that the squid nigiri card you’re passing may be just what she needs to beat you? And at each passing of the cards, your choices get more and more limited. It can get pretty cutthroat—in a good way—for a “kids game”. The choices, the planning, and the risks you take make this seemingly light game deeper than one would think. My three nephews are extremely competitive, and they LOVE this game. At a recent vacation, this is the game that came to the table the most often. I enjoyed watching how they approached their hands. One was all about the long game and loading up on puddings, another collected maki rolls for points, and the third used the wasabi + nigiri approach. Any game that allows different approaches like this, along with the potential for smack talk, is always going to be a hit at the table. This is a card drafting game such as the likes of 7 Wonders but is much simpler. The theme is solid, you are dining out at a sushi restaurant and are picking dishes off a conveyer belt for 3 courses and desert, the artwork is lovely and is guaranteed to get you craving sushi or at least make you hungry! Each player gets dealt a hand of cards, they pick one and then pass their hand around the group and repeat for three rounds (aka three courses) adding up scores at the end of each round, with pudding collected during all three courses being scored at the end of the game. Pudding – Pudding is only scored at the end of all 3 rounds, the person with the most scores 6 points, the person with the least scores -6 points. This is a small compact, quick game that is ideal for travelling or maybe whilst waiting for food at a restaurant. I have recently played this with a group of non-gamer friends whilst having a girly weekend away… they all loved it and wanted to play a second game straight away. I would say this plays best with 4 players, when playing with two the best way is to play with a dummy hand but this isn’t ideal. Don’t be fooled by thinking this is a kids game, this is great for any age. Sushi Go! does what it sets out to do very well but is lacking in depth. This game has luck and light strategy so is more for the casual and family gamer or if you are trying to convert someone new to the hobby. This game doesn’t cost much so even if you are buying this thinking you may only play It on one holiday / trip then I would say this is worth it. Definitely a great game for the whole family or just a nice filler game….but beware you may need snacks at the ready to combat the hunger inducing theme! Sushi Go! is an easy-to-teach game, which is so well produced that you’ll have no trouble selling it to new gamers (whether they like raw fish or not). Everyone starts with a hand full of cards. Each turn you pick one to keep and pass the rest on. You do that for three rounds. Most points at the end wins. Mechanically, that’s pretty much it. Different sushi each score points in different ways (which I won’t explain here). The skill of the game becomes identifying what your opponents are trying to collect. From there you can either try and block them by taking those cards yourself, or try and focus on what they’re not taking and get more points than them. The game is fast, light and gorgeous. The card stock is great and the rules are easily digestible (pun completely intended). An easy crowd pleaser. Highly recommended. Sushi Go is a fantastic example of something that is deceptively simple and looks–to be honest–like there isn’t anything behind that, beyond the “simple game”. Wrong wrong wrong. It’s flat out good and pretty **** addictive. Game mechanics are indeed simple but after a couple of games you see the different strategies begin to pop up. You also understand certain frames–for example…Everyone is dealt a hand of cards. What isn’t clear immediately is after playing one round you understand that round plays very independently of the one following. Each player turn has all the players rotating your present hand so you suss what’s available that round. You finish a round and dispose of all of those cards and re-deal for the next round. There are 3 rounds so you have different options. Simple and elegant. Certain cards are played and held by the player to be scored on the last round–pudding for the dessert. This game is a lot of fun and around 20 minutes to play. It’s great for a travel game. I recommend it. Everyone I’ve introduced Sushi Go to loved this game. Most of them are casual and social gamers and prefer games that are easy to pick up and fun to play. We always have laughs over who took what and how we foil each other’s collections. The cutely designed cards top the icing on the cake! For our first game review, we decided to review one of our newest games – Sushi Go! Sushi Go! is a fast-paced card game for 2 – 5 players that takes place over 3 rounds. It only takes around 15 minutes to complete a game. The object of the game is to create the best combination of sushi dishes, by choosing from hands of cards that are passed either back in forth in a two player game, or around the table in a 3 – 5 player game. We love this games for several reasons – it is fast-paced, portable, and has adorable artwork. It is far more fun and strategic with 3 – 5 players, however, there is a two-player variant that involves a third “dummy” that the two players alternate control of. We highly recommend using the two-player variant for two-player games; the variant makes the game more strategic and less predictable, primarily because the dummy’s cards are in a facedown pile, so neither player knows what extra card they are going to draw when they control the dummy. With that being said, we definitely feel that Sushi Go! is a worthwhile game to add to any collection, especially because of its portability and low price. This is a simple card drafting game that is played over 3 rounds. The goal of the game is to construct a hand of cards that produces the highest score each round and, ultimately, at the end of the game. The game is played by each player starting with a set of cards, selecting and revealing a card from that set, and then passing the remaining cards to their neighbour. Each time a player receives a set of cards, they must choose and reveal one of the cards to contribute to the hand in front of them. Once all the cards have been passed, selected, and revealed, the round is over and each player’s hand is scored. Scoring is calculated based on the various combinations of cards (sushi) that each player has drafted to their hand. The fact that each card is selected and then revealed allows players to strategize for themselves, and against their opponents, which creates a light element of interactivity between players. 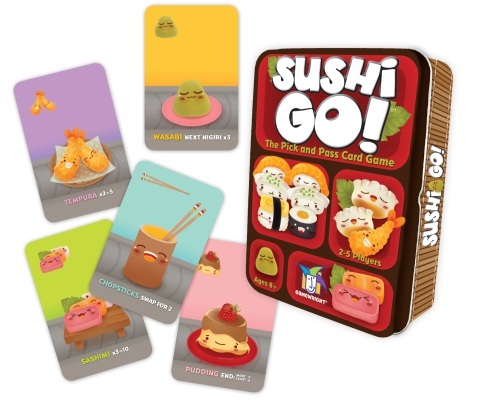 Sushi Go retains the core mechanic of Card Drafting, and creates short term and long term goals by having players focus on building their hands each round, but also collecting cards which are scored at the end of the game. The game isn’t deep by any stretch, but because starting hands are always randomized, the replay value of this game is excellent. This game is a perfect example of card drafting mechanics, and is simple and cute enough to attract casual and less experienced gamers. I’d go as far as to say that this game is a perfect introduction to more complicated card drafters, such as 7 Wonders. Its ruleset is simple and consistent, and players learning this game need only to play through a single round to fully understand the rules of the game. For its size, this game is engaging and fun, and is a great little game to bring on trips to the cottage and camping. This is an extremely light game with cute art and a simple drafting mechanism. The scoring is a little wonky but young kids can understand the game well enough to play even if they cant total their own score. Game plays very fast once every one knows the rules and you can get a complete 3 round game in under 15 minutes easily. The soy sauce add on cards are highly recommended to add a little depth (with soy this game is an 8). Add a Review for "Sushi Go! (Second Edition)"